As the International Federation of Football Associations (FIFA) elects its president, its incumbent head Joseph Blatter comes under fire from Western nations, but keeps the backing of Africa and Asia. Read RT's live updates on #FIFAgate here. 78-year-old Blatter needs 105 votes out of 209 to be re-elected for a fifth term. He has the support of the 47 members of the Asian Football Confederation, which has stressed its position time and again. "The AFC reiterates its decision taken at the AFC Congress in Sao Paulo in 2014, endorsed at subsequent Congresses in Melbourne and Manama in 2015, to support FIFA President Joseph S. Blatter," its statement on Thursday said. The AFC opposed any possible delay to the election proposed by some following Wednesday's arrest of 14 FIFA officials and businessmen on FIFA-related corruption charges. The same line of thinking was voiced by the African Football Confederation, which holds 54 votes. The two confederations make up about half of all the votes that will be cast on Friday. This unwavering support is due to what Blatter has done for African and Asian football during his term, Alexander Mercouris, international affairs editor for Russia Insider Magazine, told RT. "Blatter himself has always been a strong supporter of the African and Asian countries in football. He's basically broken with the duopoly that Europe and Latin America traditionally had in the sport. He has made it more global and he has brought in people from these two vast regions, and they are grateful to him, and they support him,” Mercouris said. “The Europeans who, together with the Latin Americans, have tended to see football as their thing, are obviously less than pleased, and that's why they are so strongly united in their opposition to him," he added. 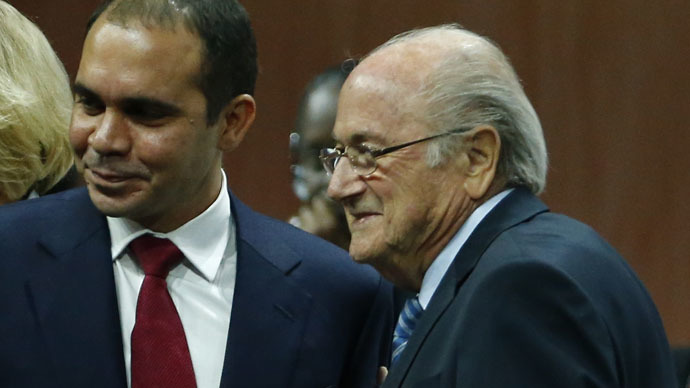 Blatter's only opponent is Jordanian Prince Ali bin al-Hussein. Half Blatter's age, Hussein, 39, has been vice-president of FIFA for the past four years. The third son of the late king Hussein of Jordan has also been the president of his country's football association since 1999 and the West Asian Football Federation since 2001. The prince also has military and wrestling background. Prince al-Hussein has the backing of the European Football Association (UEFA) and the US, but that might be more of a pledge against Blatter than for the prince. On Thursday, UEFA head Michel Platini promised a guaranteed 45 UEFA votes and said he hoped for 53, adding: "People don't need a president like Blatter. FIFA is not as strong as it used to be. It needs a new president. Enough with Blatter."